The Stockport five-piece are set to play the Manchester festival, along with White Lies and Pigeon Detectives. The final wave of acts have been announced for Neighbourhood Festival 2016. Blossoms, White Lies and Pigeon Detectives have all been confirmed for the Manchester event, which will take place on 8 October this year. Hosted in 10 venues across the city - including The Ritz, Gorilla, Deaf Institute, Sound Control, The Zoo, Dog Bowl and XOLO - the all-day event will also see performances from Circa Waves, Twin Atlantic and Lonely The Brave. One wristband will grant access to all 10 venues. 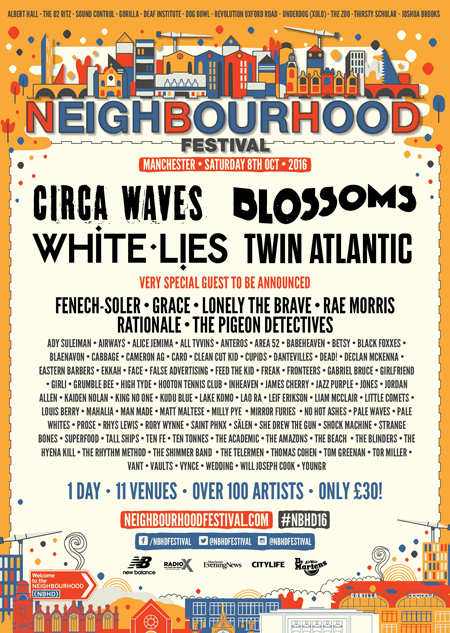 Visit neighbourhoodfestival.co.uk for tickets and more information.